Careful notes are the key to freezer success. I keep each type of food segregated in the freezer and draw a map so that I can find things easily. Since I clean out the freezer entirely every spring and freeze in clear plastic containers, I don't even need to label my produce. I do keep a very careful list of how much of each vegetable I've frozen, though. 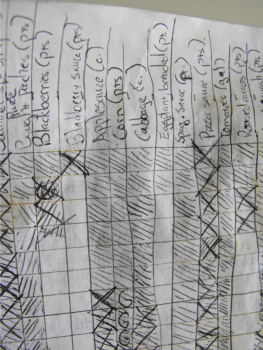 Using a piece of graph paper, I list the name of each vegetable at the top, then hash off a square for each cup, pint, quart, or gallon (depending on the food) as I throw the day's produce in the freezer. Once winter comes and I start pulling food out, I cross off the squares for food I've used. That way I have a quick visual estimate of what I'm getting low on and don't end up eating all of the green beans in December and ignoring the summer squash until February. This year, I'm finally starting to get a handle on how much of each type of vegetable I should freeze. I've included a table below with my goals for this year --- keep in mind that you probably like some vegetables more or less than we do and that this is for two people. The container size listed is a good size to provide one meal for the two of us. (Some vegetables, like summer squash, become much smaller when they thaw.) You'll notice my table has very little information on fruit since our fruit hasn't really come into production yet. I'm curious why you clean your freezer in the spring rather than once the new food starts coming in? Not that I mind, one bit, having the old stuff show up at my house. Enjoyed some corn just yesterday! In a perfect world, I'd clean it once new food starts coming in, but I let the ice get out of hand and I couldn't get to the food I wanted without a hammer and chisel! So I figured it was time to clean it out. I'm glad you like the stuff I sent you --- I appreciate you taking it off my hands!! In your experience, what has been the best container for freezing? Heavy-duty zip-loc-style bags, plastic tupperwares, something else? Wayde --- Ziploc bags would probably work very well, but I don't like washing them out and don't approve of throwing them away, so I don't use them. We use plastic containers, and if you're starting from scratch I highly recommend finding a huge mass of them all the same shape so they're easy to stack. Ours are round, but rectangles would use up less space per unit food.